Thinking about an apprenticeship? We asked three of our current apprentices, Louise Cornforth, Naeem Dudhiya and James Wilks, how they would describe their experiences, and the best thing about their apprenticeships – here’s what they said. Why did you choose to do an apprenticeship with AXA? 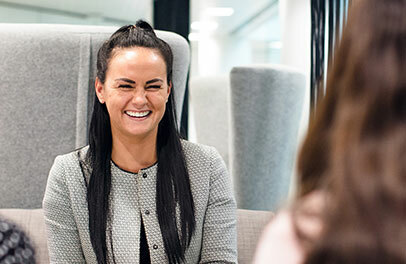 Louise: I chose this apprenticeship as I wanted to start a great career and saw it as a fantastic opportunity to be able to work for one of the biggest and well known insurers in the UK. I knew that they would be able to give me the resources to help my development and support me through my career. Naeem: AXA is recognised as one of the Sunday Times Top 25 Best Big Companies to Work For, so for me it was a no brainer! 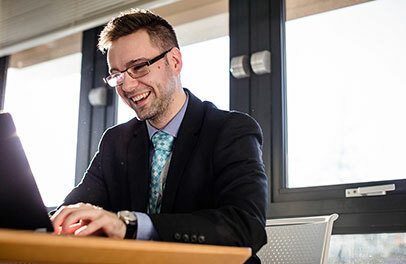 As a Commercial Underwriter I knew I’d be supported to achieve my potential and gain valuable experience while achieving a widely recognised qualification. James: I wanted to work in the financial sector and I was already studying for my CII. I saw my apprenticeship as the perfect opportunity for me to continue studying, while getting on-the-job experience. It felt like a long shot, but it shows that you don’t need experience, you’ll be given the opportunity to prove yourself. What’s your favourite bit about your apprenticeship? 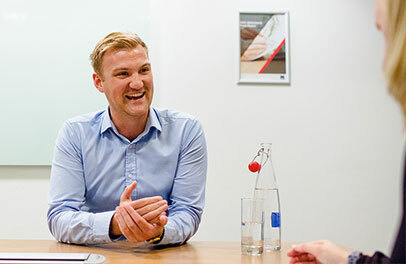 James: Every three weeks we have a learning workshop day – I really look forward to these as it’s great fun and we learn a lot about insurance. Louise: I agree. They are challenging sessions and there’s usually a quiz at the end, which is super competitive, but great fun! Our trainer is fantastic. 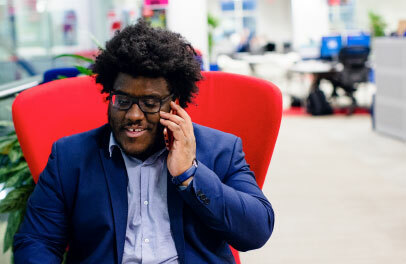 Naeem: For me, it’s all about the variety – having great friends as colleagues, communicating with AXA’s brokers and the general atmosphere is fantastic. And it isn’t all about the work – there are lots of events throughout the year, from cocktail making lessons, to Christmas parties and award ceremonies, which makes me feel like a valued member of the team. What’s the most surprising aspect of working at AXA? 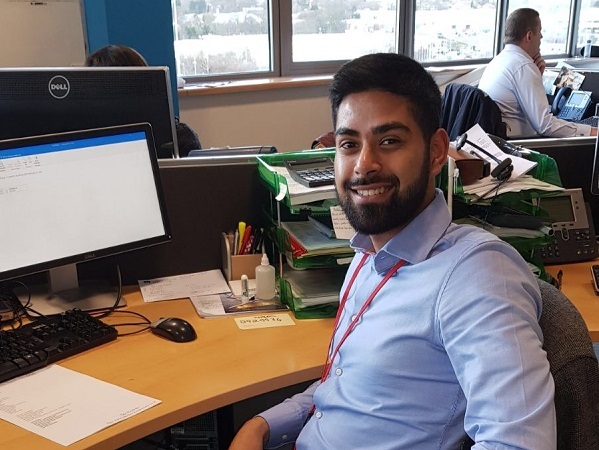 Naeem: Sometimes being the new person can feel daunting – but at AXA, that’s not the case, whether it’s my Team Manager, Branch Manager or Underwriting Manager, I’ve been welcomed and supported every step of the way. Louise: I feel the same as Naeem. The working environment surprised me – it’s like a big family here, there’s lots of support from colleagues, team leaders and managers. James: It’s support for me too. It’s laid back and although there are targets to hit, you’re supported to achieve them. What would you say to someone considering an apprenticeship with AXA? Louise: Go for it! If you’re up for a challenge and want to learn, this is the opportunity for you. James: Do it! There’s lots of role variety here and freedom to move – as long as you work hard, you can get to where you want to go. Naeem: This was the best decision I ever made and I haven’t looked back. Earning and learning is great – and you’re almost guaranteed a job at the end of it. It’s win, win! 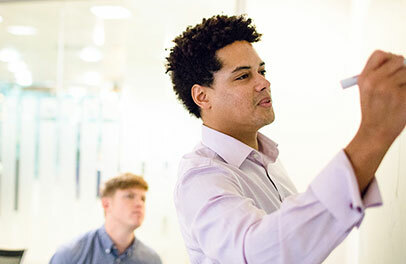 If Louise, Naeem and James have inspired you to make a great decision for your future career, you can look out on our careers website for all apprenticeship roles that are currently available. You can also sign up for alerts if we don’t have anything of interest to you right now.